Hi! I love looking at other people's sewing rooms. It is so much fun to see how others organize and lay out their workspace. If you would like to see over 200 sewing rooms, be sure to join the Yahoo! group yoursewingroom. Here is the sewing room plan I chose to go with to accommodate the new Sweet 16. This is the first time I've had everything against the walls. I used to prefer the sewing machine desk coming into the room so that the quilt tops could drape over the back when needed. Since I now have the Sweet 16 for quilting, I can try the sewing table along the wall. My sewing/embroidery on the left, Sweet 16 to the right. My newest addition. Let the play time begin! I do like having the sewing tables in a row so that they can act as table extensions to the Sweet 16 for supporting large quilt tops. Storage closet and Cutting/Ironing Table. Singer 160 and dresser for storage. I moved another thread rack to a wall inside the closet so I could have room for the quilt rulers on top of the small dresser. I also took down the knitting machine and put my black Singer 16o on top of the small sewing desk. Tall dresser with TV, small file cabinets, and design wall. The door with the mirror is the entrance. The door with the scissors is a walk-in closet. Another view of that corner. I like being able to look out the window while I'm in this room. This window faces out the front of our home, so I can see anyone coming into our driveway, and my older kids coming home from the bus. I tried to merge two photos so you can see the general overall view of this side of the room. My machine-embroidered cross-stitch design on the wall. I added a couple of photos so you can peek inside my closet. It is a small walk-in style. I know that this is the neatest it can probably be. Thanks for stopping by my sewing room! I love it! Good job!!! Enjoy your space! Thank you for the ideas, Michelle! Hi Sylvia. 'Glad the Sweet 16 made it safe and sound to you. Your sewing room looks great! I'm jealous. One thing, do you think you'll have enough room to the right and left of the Sweet 16 to accomodate a large quilt? Seems a bit tight to me. 'Guess you'll find out once you get started. Happy quilting, Bea L.
Hi Bea. You packed your machine well! I don't know if there will be enough room to the right of the Sweet 16. I think there is plenty to the left. I thought I would move my laptop out of the way, and push the monitor back if needed. That will give me an extra 2' to the right. We'll see how it goes. I'll have fun using it. Cheers! Your room looks great! I see what looks like a jelly roll race quilt on your wall, will that be your first project on your Sweet 16? 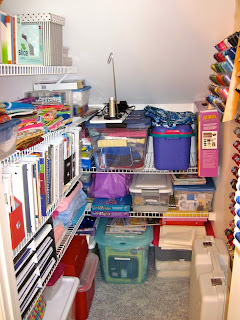 Like you, I love to see the sewing rooms of others and already belong to the Yahoo group yoursewingroom. You may have already seen photos of my room on my blog, but if you haven't, I have a photo folder named AzJune Sewing Room. A while back, I started a page on my blog of my favorite sewing rooms so that I could share them with others. Do you mind if I add yours to my list? Thanks June. The jelly roll quilt is for charity, so it probably will be the first "real" quilt I do on the Sweet 16, since it won't be perfect. I need to practice on scraps first. I have seen your blog and really like your room. I would be honored if you added my room to your list. Wow! Your studio is so neat and clean! How do you do it? I've just come over from Sew Many Ways Friend Friday link party. I'm your newest follower! Would love it if you would come over and follow me too! Thanks for coming over. The trick is to take a photo as soon as the room is clean because it doesn't look that neat once you get your projects going! :) I'm following your blog too! I'm interested in the Tiara too - I'll check it out soon. But wanted to know what you think about it. I have little experience doing free motion quilting, but think this would be a good start. I do small art quilt mostly. Do you have the stitch regulator? I love it so far! I am limited with my prior experience with FMQ too, and agree that this would be a good machine to start with. I didn't want to FMQ on my regular sewing machine. This one has so much more room. My machine did not have the stitch regulator with it, but I am working on getting it right now. :-) I do think it will help with my FMQ stitching. Love Love it! I got the SEW letters from the JoAnn store. They are paper mache and sold in the art section. I covered them with fabric and used Mod Podge to secure the material on the backside. 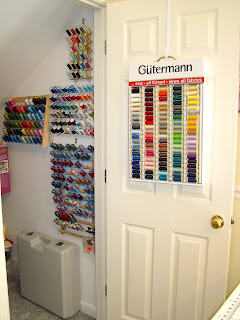 I want a sewing room sooooooooo bad! I love the sewing room sign on your door. Thanks for sharing at Submarine Sunday!!! So glad you came by Tonna. Love your Linky Party! Thanks for sharing at last week's Submarine Sunday link party! Your craft room was the most popular project this week and is featured at this week's party. I hope you'll link up again this week, and don't forget to grab a feature button! Es una verdadera preciosidad. Haber si poco a poco consigo tener uno yo más o menos parecido. Wow - your sewing room is amazing! I'm very jealous - i sew on our dining room table and have to pack things away into the corner of the room. The Sweet 16 machine looks great, i'm going to have to go off and read about it :o) Thanks for sharing your space.